We are experiencing the third consecutive growing season drought at my place. There hasn’t been a drop of rain in many weeks. Clover usually doesn’t tolerate such drought conditions very well. In fact, clover rarely is productive on rocky ridge tops that simply don’t hold much soil moisture. 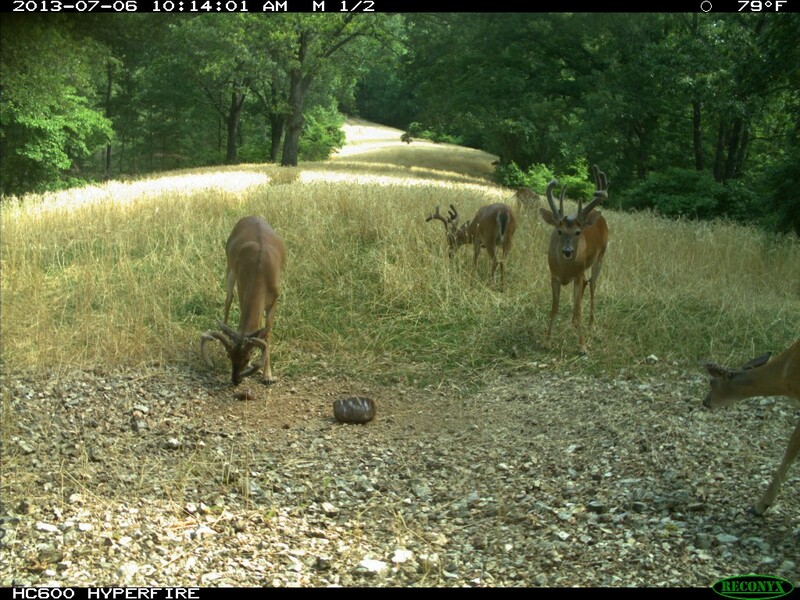 If you look at the feet of the bucks in this recent picture, you will notice the clover looks good – great for being in a long, severe drought and on a rocky ridge top! When planting your clover food plots, don’t forget to consider adding a good cover crop. There are a couple of reasons this is the case. For years, I’ve used Antler Dirt fertilizer. Antler Dirt is composted and humified poultry litter. It’s full of great nutrients, naturally balances the soil’s pH, and adds a HUGE amount of organic matter. Regular pelletized fertilizer is acid (lime must be added to balance the pH in most cases) and has no organic matter. Organic matter is the key to holding soil moisture! The great soils of the prairie states had a bunch of organic matter. Second is the cover crop! Clover, especially new stands of clover, almost always benefit from a cover crop. My favorite cover crop for clover is wheat. It seems most food plot farmers consider all wheat the same. That’s absolutely not the case. Many universities perform extensive wheat variety comparisons year after year. Wheat is a very important crop in America. Some wheat varieties produce more heads, some ripen quicker, etc. For the purpose of a cover crop, I like a wheat variety that produces a lot of forage (stays in the blade stage longer before making a stem in the spring) and stands erect even in windy/tough weather. I also want the wheat to produce a lot of grain and hold the grain so it doesn’t shatter easily. You will note those characteristics in the wheat pictured above. Eagle Seed picked this wheat variety years ago based on several university studies. They call it Monster Wheat. I simply like it because it meets all my requirements. It does a great job of protecting the clover, continues standing even after it dries out and yields a lot of grain. Even if the clover in this plot goes dormant due to the drought, the standing wheat grain will continue feeding the bucks and other deer and turkey using this plot – probably until the next rain and the clover starts providing quality forage again. When planting your clover food plots, don’t forget to consider adding a good cover crop. It is a great tool that is easy to include in your food plot program – benefiting other crops plus providing quality food for wildlife during the stress season.